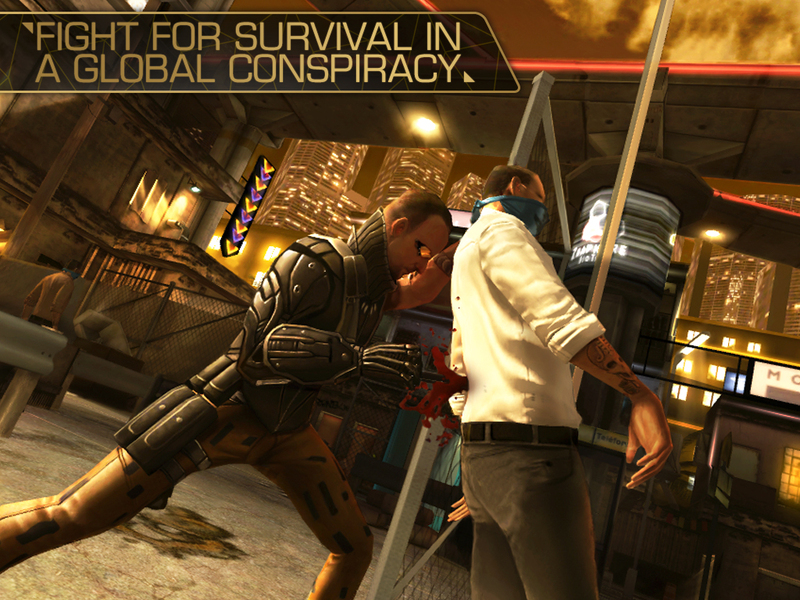 When Square Enix announced that the next entry in the highly regarded Deus Ex series would be a mobile-only title, there was a lot of blowback. The original Deus Ex was a landmark PC title back in 2000, both for its immersive atmosphere and game world as well as its emphasis on player choice and branching dialogue paths that could affect how the game played out. Having such a darling in video game’s history be relegated to “just a mobile title" left a lot of people pretty darn miffed. 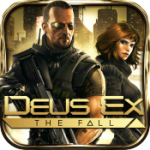 Well, here’s the thing: I haven’t played any of the previous Deus Ex games (video game blasphemy, I know) and I love mobile games, so I was more than a little excited to check out Deus Ex: The Fall ($4.99) when it hit this week. Not having any previous attachment to the series, I was able to approach The Fall fresh, and I came away with the feeling that this is easily amongst the best first-person shooters on the App Store. 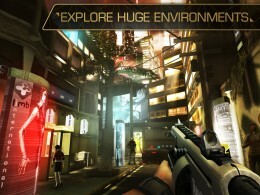 Deus Ex: The Fall, like its predecessors, is a combination of many different genres: first-person shooter, cover-based shooter, role-playing and stealth. Also like previous games in the series, there is a lot of player choice to how you’ll experience and play through the game. Dialogue has branching paths, you can choose to be a merciless killer or more of a pacifist, and the story can change based on the choices you make. The story itself is a bit convoluted and can be hard to follow, possibly less so for people who are intimately familiar with the previous games’ storylines. 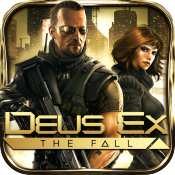 The Fall takes place after the events of ‘Deus Ex: Icarus Effect’, a novel written as a prequel to 2011’s Deus Ex: Human Revolution, and features two of the main characters from the book: Ben Saxson and Anna Kelso. As you might expect for the story in a Deus Ex game, conspiracies, shadowy organizations, double crosses and twists abound. Let’s put the story and connections to previous games aside though, and focus on The Fall as strictly a mobile FPS game. First and foremost I want to talk about the controls. Touch controls for FPS games have come a long way since the iPhone’s debut, but even the best implementation of virtual controls don’t jive with everybody. I feel like you either click with them and enjoy mobile FPS games, or you don’t click with them and avoid the genre altogether. There’s usually very little middle ground. For the folks that do like touchscreen FPS games, The Fall‘s control scheme is probably the best I’ve seen on the platform, especially considering all the mechanics it has to cover. Lots of times an FPS will be either tap-to-move and tap-to-target, or a set of virtual analog sticks that are either visually represented with graphics or utilize either side of the touchscreen to achieve the same effect. Deus Ex: The Fall actually uses both schemes in tandem, to great effect. You can double-tap (or toggle to single-tap in the Options) to move to a location, and tap directly on enemies to target them. However, you also always have full dual-stick style controls at your disposal. This means you can double-tap to start moving to a point in a level, and as you’re automatically moving towards that position you can freely aim and fire on enemies. You have a similar benefit when tapping and targeting enemies. This means that you can focus on one task at a time more efficiently, whereas in a game that uses one or the other of the two control schemes things can be a bit clunky when the action gets hectic. Running to a position while turning and strafing to open fire on some enemies can be tricky, but in The Fall it feels fantastic. That leads to another thing that Deus Ex: The Fall does well, and that’s give the player plenty of options to play the way they wish. You can choose the default tap-to-target or pick an auto-aim option, change tap-to-move to a single tap or just turn it off altogether, or toggle a variety of options for how the camera and movement works in the game. There are also a set of virtual buttons surrounding the edge of the screen which let you do things like fire your weapon, crouch or stand, toss grenades, and “stick" in and out of cover against walls or barriers. A clever touch-and-hold system is used to give you access to quick slots for items and weapons without cluttering up the screen with more buttons than is necessary. Overall, the controls and HUD system in The Fall feel like the coalescence of all the touch-based schemes that have come in games before it. That level of customization extends to your actual character, Ben Saxon. Like many of the characters in the Deus Ex universe, Ben is augmented with machinery that gives him some pretty incredible powers, kind of like a cyborg. As you play you’ll be able to upgrade and add new features to Ben’s body, giving him even more abilities. This is where the RPG element really comes in, as you’re able to mold Ben in the direction that suits you best, from a stealthy and tactical assassin to a guns blazin’ tank of a man who isn’t afraid to blast any enemies that might get in his way. While the combat is just one aspect of the overall package in The Fall, it isn’t as sharp as it needs to be to be completely successful. As mentioned, you can choose how to deal with combat situations – quietly and non-lethally dispatching your foes or just mowing them down at first sight. Unfortunately, this can be difficult to do with the touch controls in The Fall, and mostly has to do with the cover mechanic. When stuck against a wall or barrier it can be clunky trying to target and then quietly open fire on an enemy with a silenced weapon or melee move without raising the awareness of others. Attaching and detaching to surfaces just feels a little too stiff, and despite my efforts to be the ninja-like operative I was trying to be, more often than not a confrontation with multiple enemies ended up in an all-out firefight. It’s not a game-breaking problem, and you do warm up to the combat system as you go, but the clunkiness can interfere with the specific way you’re trying to play Deus Ex which is kind of a letdown. Visually, The Fall is quite a looker. Its style is reminiscent of Deus Ex: Human Revolution, which makes sense as both are close in proximity time-wise. The environments are all quite detailed, though they do tend to feel repetitive during some of the longer levels. If you’re the type who likes to fully explore every nook and cranny of a level (I am that type) then you will occasionally be rewarded with an item, an extra bit of story info, or even an alternate path which can give you the jump on a group of enemies or lead to an interesting area. 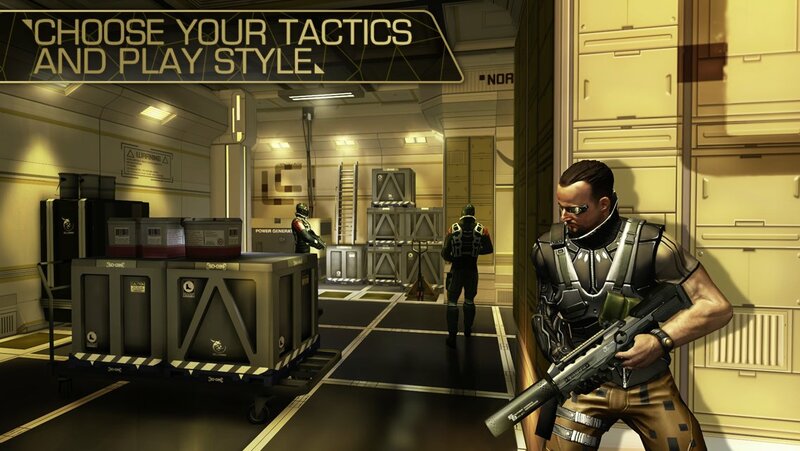 I could probably just go on and on about Deus Ex: The Fall, but the bottom line for me is that despite a few hiccups here and there it’s one of the finest first-person shooters ever released for mobile platforms. It reeks of “console quality" in terms of story, production values and visuals, and it’s just straight-up fun to play. If you are a huge Deus Ex nut and are wondering if The Fall lives up to the series’ lofty expectations, I don’t think I can answer that. However, on its own merits, I’ve enjoyed just about everything in The Fall from the gameplay to the story and all that’s in-between. One other thing worth mentioning is that Deus Ex: The Fall‘s story might have been somewhat confusing for me at times, and it looks like there will be more coming to the story in future updates, but I’m definitely excited to go back and dive into the first three Deus Ex games and even the novels now. The universe is so rich, and there’s so many little details to find throughout the journey in The Fall, I can really see why the series has such a rabid fan base. I think The Fall will be my gateway drug into the world of Deus Ex, and I’m stoked about that. If you’re like me and aren’t up to snuff with your knowledge of previous Deus Ex games and are worried if you’ll be able to get enjoyment out of The Fall, I think that you will. I certainly have. If you’re a Deus Ex fan who was upset that the new game is mobile only, I still think it’s worth giving a chance, and you might be pleasantly surprised. 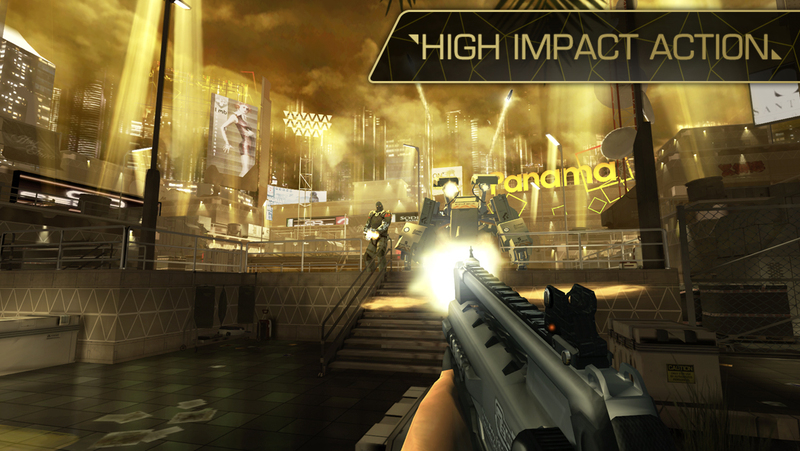 Impressions in our forums have been overwhelmingly positive, and for all future top-tier action games on iOS, the bar has been set high with the release of Deus Ex: The Fall.